Johan Cruz was part of Marco Paddy's first July 2nd international class in 2012, receiving the second highest bonus at $450,000 at 17 years old. In Cruz's first pro season in the DSL he hit a paltry .123/.216/.376. The shortstop made adjustments and returned to the DSL and hit .329/.424/.895 at 18 years old in 2014. This earned Cruz a mid-season promotion to the AZL to finish out the season. In 2015 the Sox sent Cruz to Great Falls and in his first rookie ball season he surprised and impressed with a high contact rate and some power. He ended up being one of the team's best producers at the plate, posting a .312/.338/.442 line with 6 home runs. In 2016, he was young-for-level 20-year old in Kannapolis, and had his ups and downs. He missed some time multiple times due to minor injuries and illness, and finished the season with a .255/.323/.371 line, a decent 7.8% walk rate that was much higher than 2015, and a reasonable 21.7% K/PA. He also hit 5 home runs in 65 games in a relatively tough power environment. Then in 2017 he was promoted again, to High A, but the 21-year-old struggled at the plate once more (.218/.256/.350) and again missed time to undisclosed injury (played in 75 games). 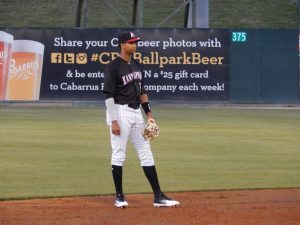 2018 had him back in Kannapolis for his age 22 season, he's healthy and playing every day, but his sub-.600 OPS is not so great. Cruz was described at signing time by Baseball America as one of the best defensive shortstops in the Dominican, but his bat needed to catch up. A lot of Cruz's value comes from his defense. He's played a mix of shortstop and third base as a pro, where he flashes elite athleticism and some great plays but is still loose overall defensively. Plenty of arm for the left side though. In the end though, he hasn't hit outside rookie ball, and his plate presence is inconsistent. There's not much power to speak of either. At this point, he's got a narrow window to hit, perhaps for a utility role, but much development remains for him to get there.